Bring Octavia's Brood's Authors to Your Town! Octavia’s Brood (IAS/AK Press, 2015) co-editors Walidah Imarisha and adrienne maree brown, as well as many of the contributors, will be touring with the book in Spring and Fall 2015 and want to come to a campus, community center or bookstore near you! All organizing is science fiction. A world where everyone has a home, a great education, community based transformative justice, nourishing food to eat and clean water to drink, where we are in right relation to the planet, to each other, where we are free to be and love ourselves as we are, to grow together? We have never seen it. 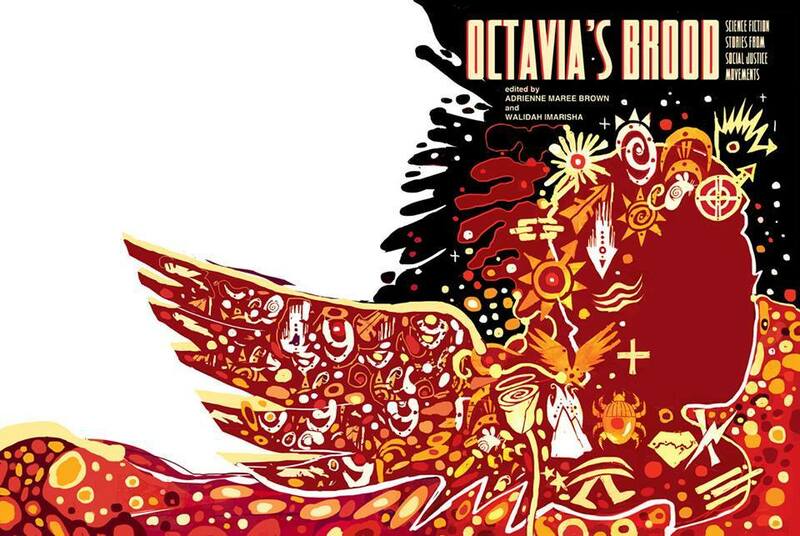 But Octavia’s Brood: Science Fiction Stories From Social Justice Movements (AK Press/IAS, 2015) can help us envision that world. Octavia’s Brood is an anthology of original science fiction from social justice movements written by organizers and activists. Each of the 20 stories reimagines the world we live in, putting forth compelling futures with new questions, new visions to explore. We will be touring April through June 2015, and then looking to Fall 2015 as well. Reading: The co-editors/writers read excerpts from their pieces in the anthology, and engage in a community conversation around radical science fiction and organizing. Presentation: The co-editors/writers present about Octavia’s Brood in the context of the history of sci fi and social change, sharing tools for using science fiction as a practice ground for social justice strategizing and vision. Collective Sci-Fi Writing Workshop: After a brief presentation on the larger themes of sci fi and social change, the co-editors/writers will lead participants through a collective story-telling/writing workshop where they create collective and individual stories based on current political issues. Science Fiction Poetry Workshop: Poetry has often been a method of survival for marginalized groups, a way of expressing emotions and knowledge the mainstream seeks to ignore. This will be combined with the visionary framework of sci fi in this workshop. Participants will merge two literary genres, sci fi and poetry, to explore prompts generated during the workshop. There will be paired as well as large group sharing time. Sci Fi and Direct Action Training: Participants will use familiar stories of other worlds (such as Star Wars, Lord of the Rings, Oz, Harry Potter, etc.) to design direct action campaigns that parallel the world we are fighting for in the here and now. By the end of the session, regimes will be toppled, evil forces vanquished and solid skills in direct action organizing developed. 2070 People’s Encyclopedia Zine Making Workshop: It has been 50 years since the historic Civil Rights/Liberation Movements of the 1960s and 1970s. In this workshop, participants will imagine themselves 55 years in the future, and engage in writing entries for the 2070 People’s Encyclopedia about current issues/events now, as a way of imagining how the world today can lead to the world we want. At the end, each participant will have a zine made during the workshop to take with them. More about Octavia’s Brood: Whenever we envision a world without war, without prisons, without injustice, we are engaging in speculative fiction. Radicals and activists devote their lives to envisioning such worlds, and then go about trying to create them. What better vehicle for them to explore their work and its possibilities than through writing original science fiction stories? Walidah Imarisha and adrienne maree brown brought together 20 radical writers to do just that. The result is Octavia’s Brood: Science Fiction Stories from Social Justice Movements, an engaging and enlightening collection that uncovers truths buried in the fantastic, and injects a healthy dose of imagination and innovation into our search for truth. It is the first book to explore the connections between radical science fiction and movements for social change, using visionary prose to weave strands of real-life experience—inequality and exploitation, struggle and solidarity—to generate innovative ways of understanding the world around us, paint visions of new worlds that could be, and teach us new ways of interacting with one another. This is visionary fiction to engage our imaginations and guide our hands in struggle. The book includes short stories from LeVar Burton, Terry Bisson, Alexis Pauline Gumbs, Alixa Garcia, Autumn Brown, Bao Phi, David Walker, Dani McClain, Dawolu Jabari Anderson, Gabriel Teodros, Jelani Wilson, Kalamu ya Salaam, Leah Lakshmi Piepzna-Samarasinha, Mia Mingus, Morrigan Phillips, Tara Betts, Tunde Oluniran, Vagabond, adrienne maree brown and Walidah Imarisha, essays by Tananarive Due and Mumia Abu-Jamal, as well as an introduction by Sheree Renee Thomas. About Walidah Imarisha: Walidah Imarisha is a writer, educator, public scholar and poet. She teaches in Portland State University’s Black Studies Department. She toured the state of Oregon for the past five years facilitating programs on Oregon Black history, alternatives to incarceration and the history of hip hop through the Oregon Humanities’ Conversation Project. She is the editor of two anthologies, the upcoming Octavia’s Brood: Science Fiction Stories From Social Justice Movements (AK Press, Spring 2015) and Another World is Possible (Subway Press, 2002). She is the author of the poetry collection Scars/Stars (Drapetomedia, 2013) and the upcoming nonfiction book on prisons, Angels with Dirty Faces (AK Press/IAS, Winter 2015). About adrienne maree brownadrienne maree brown is a 2013 Kresge Literary Arts Fellow writing science fiction in Detroit, and also received a 2013 Detroit Knight Arts Challenge Award to run a series of Octavia Butler based science fiction writing workshops. She is the co-editor of the forthcoming anthology Octavia’s Brood: Science Fiction from Social Justice Movements with Walidah Imarisha (coming 6/2014). Learning from her 15 years of movement facilitation and participation, she approaches Octavia’s work through the lens of emergent strategy – strategies rooted in relationship, adaptability, and embracing change. Adrienne has helped to launch a loose network of Octavia Butler and Emergent Strategy Reading Groups for people interested in reading Octavia’s work from a political and strategic framework, and is building with Octavia E. Butler Legacy Network on other ways of extending Butler’s work.